Three easy ways to upload your BOM! We will reply to your RFQs within one business day by your information provided below. 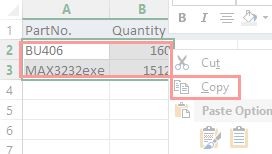 Copy and paste Part# and Quantity on separate lines. How to copy and paste BOM data? Drag a file here (.xls, .xlsx, .csv, .txt). or just download and fill in the Chipmalls BOM TEMPLATE simply.Please SAVE AS a csvformat. Address：Room 4301, Century Place - Duhuixuan , No. 3018 ShenNan Middle Road Futian Dist, Shenzhen China.